Small is having a bad, grumpy kind of day. Small thinks ‘…nobody loves me at all.’ This simply isn’t true and Small’s mother is determined to prove that no matter what questions and silly scenarios Small comes up with to try and prove otherwise. 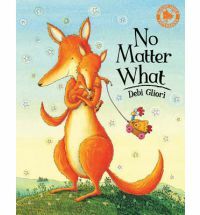 This is a beautiful book about the strength and character of love. It is a story to be embraced, cherished and shared. A beautiful tale of unconditional love. The illustrations are big, clear and inviting. This is a book definitely worth sharing with the younger ones in your life. Gliori has given us another wonderful read.